Folds to 8" x 10"
Mega-thrusters are go! 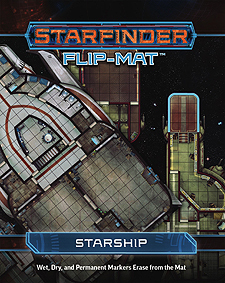 Taking adventure to the stars requires a sturdy vessel to get you there, which is why this Starfinder Flip-Mat provides you with two very different starships to pilot, explore, or raid! On one side of this deluxe, double-sided gaming map is a sleek exploratory vessel, perfect for diplomats, mercenaries, or any other groups making long forays into unknown star systems. On the other is a military dropship that doubles as an industrial freighter, providing your players with a home base, an enemy stronghold to infiltrate, or a mysterious derelict floating in the vacuum of space. Don't waste time sketching when you could be playing. With Starfinder Flip-Mat: Starship, you're ready to meet adventure on its home turf—or burn sky and live to fight another day!